00:30:00 Makes 8 servings, 1 wedge (220 g) each. Makes 8 servings, 1 wedge (220 g) each. 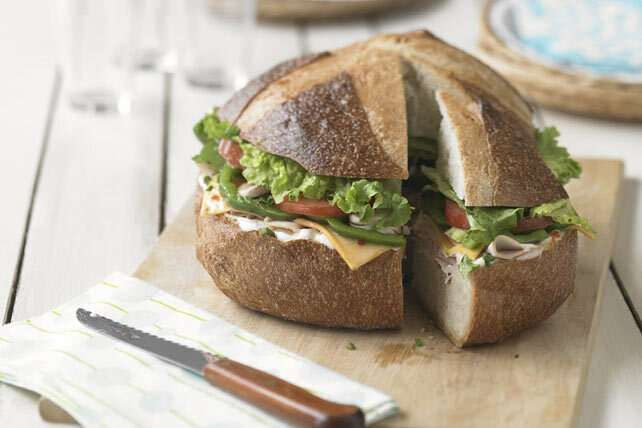 Layer up a super-sized hero sandwich fit for a crowd. Our Hero Muffuletta is made with crisp veggies, sliced deli turkey and cheese for the perfect picnic lunch. Who's the hero now? Combine first 5 ingredients; let stand 10 min. Meanwhile, cut bread horizontally in half; hollow out each half, leaving 1/2-inch-thick shell. Discard removed bread or reserve for another use. (See Tip.) Spread insides of bread shells with Miracle Whip. Drain vegetables; discard dressing. Layer turkey, Singles, vegetable mixture and lettuce in bottom half of bread; cover with top of bread. Cut into wedges. Process the removed bread (from insides of bread shells) in food processor or blender until fine crumbs form. Store in airtight container at room temperature, or in freezer, until ready to use in recipes calling for fresh bread crumbs. Serving Size Makes 8 servings, 1 wedge (220 g) each.